As a Fund Management Company headquartered in Singapore expert in foreign exchange, the client has developed a diverse products portfolio, which include a variety of forex, equity, commodity, volatility arbitrage, with over $17 millions under management. run in real time 500 to 3500 multi-timeframe strategies over 60++ instruments, simultaneously, 24/24 and sunday to friday. be reliable, performent and with low latency DMA access. change daily each strategy parameters without having to do it manually and having to restart the platform and close the strategies. execute and manage several thousands orders per day. get troughout the day and the night regular email reports about the trading activity. be able to make changement to the algorithms with a short time to market. outsource the operational support and monitoring of the production environment to technology specialised team. be able to go live as soon as possible. be competitive in term of cost. None of the usual trading platforms were able to fulfill the very specific and challenging requirements of the client. As per building an internal and tailor-made application from scratch, the solution was discarded as it would have cost them an important investment and it would have considerably delayed their go live. At Alpha Novae, we were able to provide a solution based on AlphaTrader fulfilling their requirements. 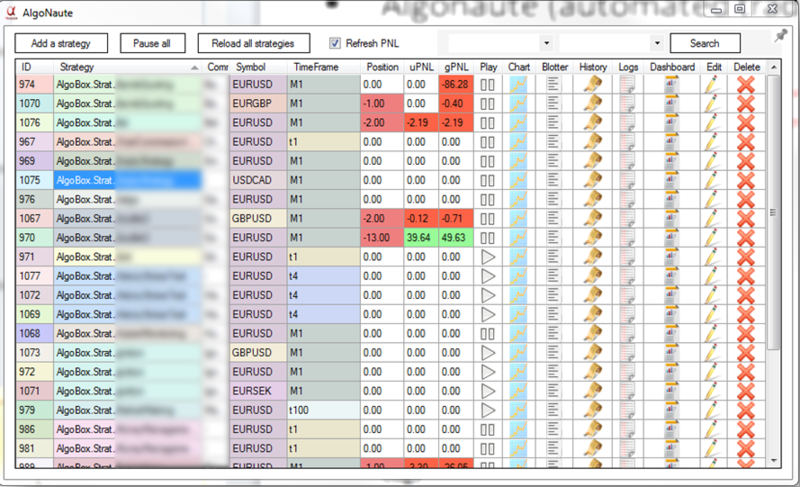 AlgoNaute, our algorithmic trading module allows portfolio strategies run. 500-3500 multi-timeframe strategies was a challenge for sure, but nothing impossible… and at Alpha Novae we quite like challenges… So after a few improvements for massive multi strategies run, AlgoNaute was ready for the task. As per the 24h/24 sunday to friday criteria, it is a common requirement on the Forex market and of course AlphaTrader was able to handle it. AlgoNaute, AlphaTrader strategy portfolio manager module. Req2: Be reliable, performant and with low latency DMA access. The match was obviou as AlphaTrader has been built for low latency DMA access. The environment would be hosted on a high performent server with a DMA connectivity to the venue. And for even more reliability and stability we created a new innovative connector to the LMAX Exchange associating both LMAX FIX and API connectivity. Req3: Change daily each strategy parameters without having to do it manually and having to restart the platform and close the strategies. This could be done on AlphaTrader. We retained a solution based on a CSV per strategy listing its parameters. The trader would generate and update the CSV for each strategy whenever required and AlphaTrader was reinitialising the strategy daily with its new parameters. Req4: Execute and manage several thousands orders per day. 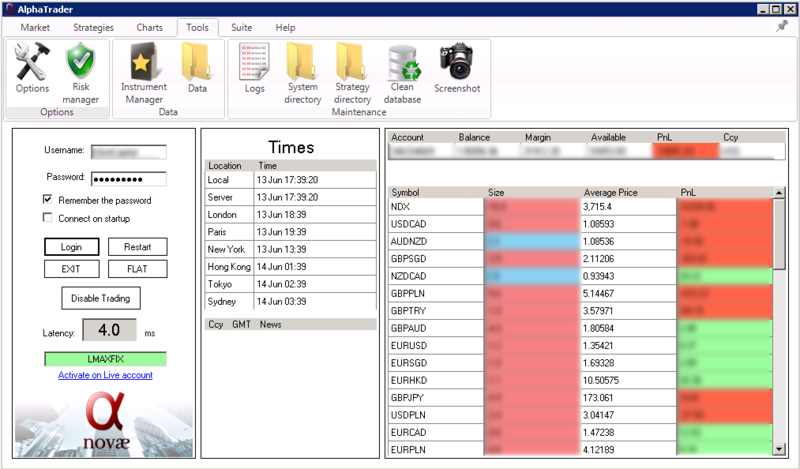 AlphaTrader handles of course thousand of orders per day. Users are also able to get post trading analysis on their orders through the trade history panel (roundtrip execution latency, slippage, etc) and thanks to the execution history panel they can track each individual fill, get their trading volumes, etc. Req5: Get troughout the day and the night regular email reports about the trading activity. A monitoring strategy has been implemented to send by email every two hours HTML reports summarizing the trading activity and specific key indicators. This report was used by Alpha Novae support team and by the client trading team. AlphaMonitoring was also used by Alpha Novae support team. Req6: Be able to make changement to the algorithms with a short time to market. AlphaTrader being the platform developped by Alpha Novae, it was natural to choose our development services. We were also able to mix the development of the algos with the addition of new functionalities to AlphaTrader to perform all the client requests. Req 7: Outsource the operational support and monitoring of the production environment to technology specialised team. The client subscribed to our fully managed solution for the operational suport, monitoring and maintenance of production environment and live trading operations. Req 8: Be able to go live as soon as possible. Alpha Novae being in same time the platform provider, the developer of the strategy into the platform, the integrator and providing the operational support, we were able to work in synergy in all the different areas without loosing any time. First algorithms went live very quickly after about one month of work and progressively new algos were added until having 500 multi-timeframe strategies. Firstly, AlphaTrader put a priority in lowering the transaction costs of his clients. So the choice of AlphaTrader trading platform and our Alpha In A Box package was natural. After a proof of concept period of 3 months of intense collaboration between Alpha Novae development team and the client, we have been able to develop the strategies and set up the trading environment based on AlphaTrader meeting all their requirements. After 6 months of live trading with us, the client went from executing less than 100 millions $ to execute monthly more than 9 billions $ through AlphaTrader! Thanks to the Alpha In A Box package, the client was able to make frequent evolution to the strategies which were rolled out as soon as possible on production. They were also able to rely on Alpha Novae expertise for the maintenance, oprational monitoring and support of its live trading operations. You can find more case studies regarding AlphaNovae client and AlphaTrader here.